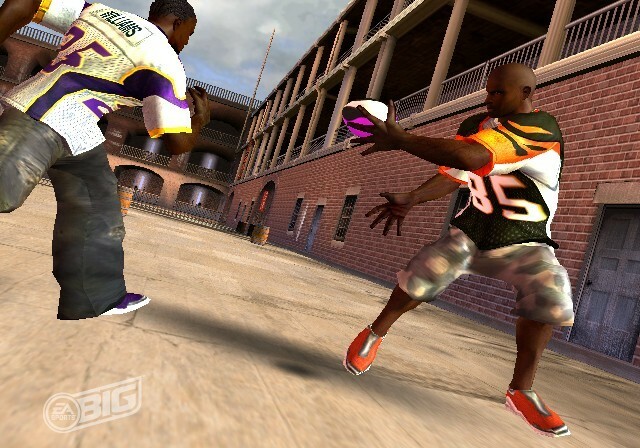 The EA Street series has proven wildly popular with its fantasy approach to the games that we know and love. Taking away the game from the playing field and putting it smack bang on the streets with wild moves and a lot of sass is what has the fans raving, and for me personally the ease of play was also a major factor in my enjoyment of the title. Once your Game Breaker meter fills up you can use your Game Breaker whenever & wherever you want by pulling off new power moves. These moves are available to both the offense and defense. 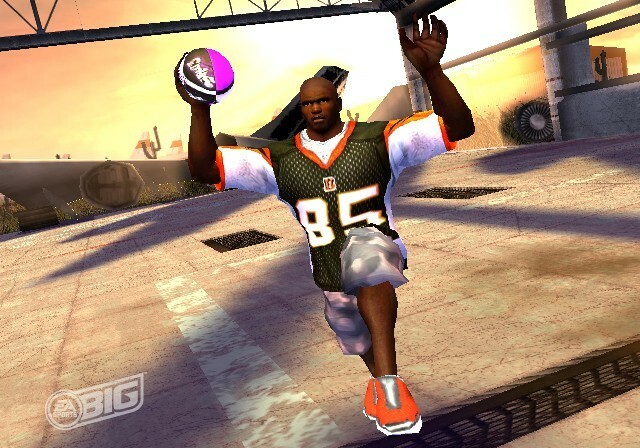 Gain big air by jumping off of objects such as, boxes and barrels on the field. Add more style to your game by doing it in the air. Once you're airborne you can pull off style moves using the Right Analog Stick. Earn enough respect and you'll get to decide how you want to play the game. 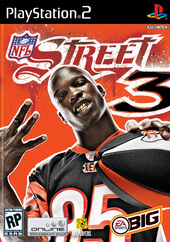 With a high respect level you can get Chad Johnson to bring you new plays for your playbook. Playbook Elimination allows you to tear the page out of your opponent's playbook! If an offensive play ends in a fumble, interception, loss of yards or an incompletion that play is thrown out and the player that is ahead when all the plays are gone is declared the winner. Other game types are Yards for Points, Bank, Defensive Scoring and Time Attack. With us having two previous games to get used to the new dynamic, this time round we are faced with taking the game a little more seriously as a lot of the things that by now you would be used to have been removed in order to have a more competitive game which really makes sense as you should not be able to whip the stars of the NFL as easily as you could in the previous titles. Though, truth be told, I liked the fact that I could do just that! One of the features that most of you would be familiar with are the Gamebreakers, crushing moves that you could pull off by filling up the Gamebreaker bar and at a crucial moment you could make a really cool cinematic start up that would show your guys doing some crazy stuff. Now that feature has been made a tad harder as you have to execute the moves in real time. However the sense of achievement when you do it is far greater. Gamebreakers can also be broken in this incarnation if your opponent pulls off the right move as you are initiating the play. This ups the ante during these moves and requires a certain amount of skill. Make sure that you take the time to go through the tutorials that are provide and pay attention to the moves that you see in the intro movie, especially the moves off the wall as well as they allow you to do some crazy stuff during air time. Another cool point to this incarnation is that you have to actually earn the right to play the game against the skilled players of the NFL, and this is achieved by getting respected by other teams that you have to play in order to make it to the top. I do think that this feature which is career mode is pretty cool and does make a lot of sense. Not only that but it gives you an appreciation for the intricacies of the game. There is definite career progression benefits too that make working your way through the “minor” leagues worthwhile as well. You have a playbook that needs to be filled and as you make your way through the game, new plays will be added and your team stats are boosted with drills that you can practise and also recruitment becomes an option. So the game covers a bit of ground in both management and also general plays. This is a good looking game with fluid graphics that move along at a nice framerate. You can definitely tell who is who in the game and there are a ton of players in the mix for you to go up against. Checking the NFL rosters though for the purpose of the review did show me that we are a little out of date here but considering the time and development that these sorts of games take, it certainly is understandable. So if you are looking for a sports game that is not your typical type of challenge, then I can say that this might be a title for you, I certainly know that I like a break from the ordinary and this game certainly provides that no problems at all.